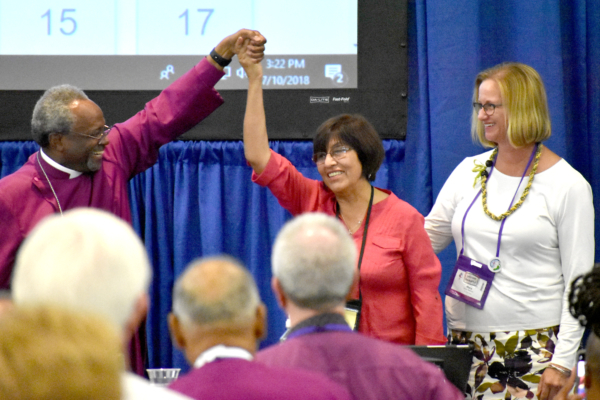 [Episcopal News Service – Austin, Texas] The Episcopal Church’s House of Bishops voted unanimously on July 10 to admit – or readmit, really – the Episcopal Church of Cuba as a diocese of the Episcopal Church. The Diocese of Cuba will become part of Province II. 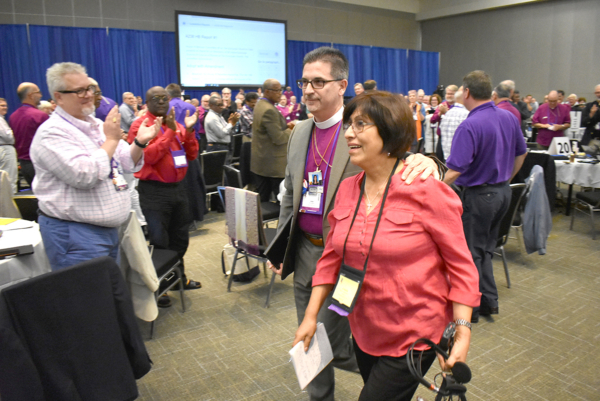 Delgado received a standing ovation, and many hugs were shared as Presiding Bishop Michael Curry asked her to take her seat at table No. 7. Reunification was a long time coming. In response to the geopolitics of the time, the House of Bishops in 1966 voted unilaterally to separate from the Episcopal Church in Cuba. The House of Bishops “stabbed Cuba in the heart, and it refused to die,” said retired Southeast Florida Bishop Leo Frade, a Cuban who was 23 years old when the house voted to expel Cuba. New Jersey Bishop William “Chip” Stokes, bishop chair of the Episcopal Church in Cuba Committee, impressed a sense of urgency on bishops to adopt Resolution A238 as amended. “Cuba’s government is in a time less restrictive toward churches,” he said, adding that U.S. policies are unpredictable. A238 lays out the terms for reunification; it now moves to the House of Deputies. The House of Bishops took its action in 1966 in response to the effects of the Cuban Revolution and the United States’ response. The Cuban Revolution, led by Fidel Castro, began in 1953 and lasted until President Fulgencio Batista was forced from power in 1959. Batista’s anti-communist, authoritarian government was replaced with a socialist state, which in 1965 aligned itself with the communist party. In 1961, Episcopal schools in Cuba had been closed and appropriated, and many clergy and their families were displaced. Some remained in Cuba; some either returned or immigrated to the United States. Some clergy who remained in Cuba were imprisoned, executed or disappeared. Church buildings were closed and left to deteriorate. The church was polarized politically, and its clergy and lay leaders suffered. But the church continued in the living rooms of the grandmothers, who held prayer services and Bible studies in their homes. Through them is transmitted a story of pain, and of faith. The Episcopal Church of Cuba traces its origins back to an Anglican presence beginning in 1901. Today, there are some 46 congregations and missions serving 10,000 members and the wider communities. During the 1960s, Castro’s government began cracking down on religion, jailing religious leaders and believers, and it wasn’t until Pope John Paul II’s 1998 visit to Cuba, the first ever visit by a Roman Catholic pope to the island, that the government began a move back toward tolerance of religion.